I’ve been a bad blogger this week. I just wasn’t at all motivated to write even though I have a backlog of recipes to share. I haven’t been blogging very long, but these things must happen from time to time. I figured it would be better to wait till I actually felt like writing than trying to force myself, blogging is supposed to be an enjoyable experience after all. The internet is a magical place, because when I googled pear ice cream I found this recipe for Pear Caramel Ice Cream. It’s adapted from The Perfect Scoop by David Lebovitz, and it is wonderful. I need to buy the book. I also discovered Herbivoracious, which I’m loving. Spread sugar in a large heavy saucepan. Cook on medium heat until the sugar has melted and is amber in colour, stirring occasionally with a heatproof spatula. Add the pears and lower the heat. Cook and stir for about 10 minutes. The pears will kind of dissolve into the sugar. Remove from the heat and add 1/2 cup of cream. The mixture will bubble up. Add the rest of the cream, salt, lemon juice and rum. Let cool to room temperature. Puree the mixture then strain till smooth. If using an ice cream maker follow your manufacturers instructions. Otherwise, pour the mixture into a freezer safe dish. Freeze for 30 minutes then use an immersion blender to mix. Repeat every 30 minutes for 2 to 3 hours until the ice cream has the right consistency. How did this ice cream set up in the freezer? I made salted butter caramel ice cream last month, ostensibly for my baked alaska, but it set so softly due to the sugar content that we ended up just saving it to eat and using something else for the DB challenge. And pear upside-down cake, yum! I made a chocolate-pear cake for dessert last night… I <3 autumn! It set pretty well. I did find the texture less creamy than the egg yolk based ice creams I made for last months challenge. 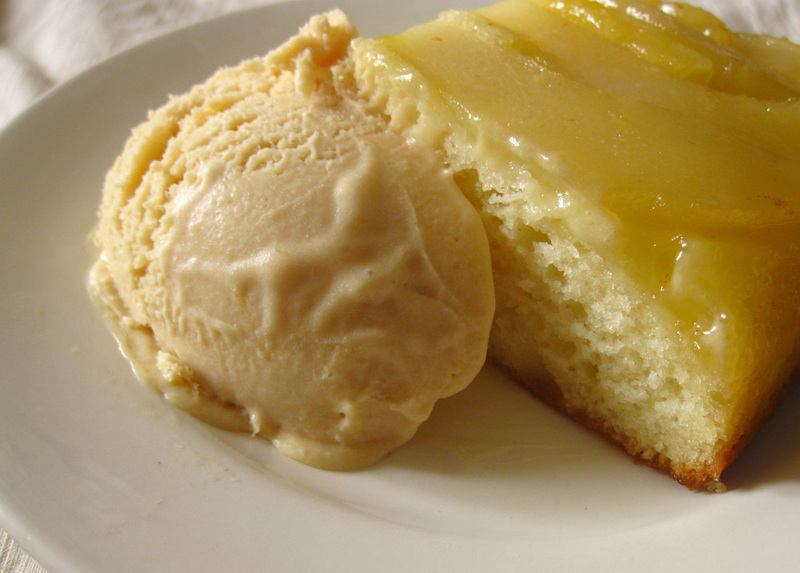 Pear caramel ice cream and pear upside down cake?! Oh my do both of those sound good. :) I love the idea for pear caramel ice cream, it sounds amazing. What wonderful flavors! I would have never thought to combine the two but I’m sure it was fabulous! Caramel and pear is a divine combination, so I can just imagine how delicious this ice cream must be.